STAFF at the Thamesfield Retirement Village nursing home in Henley took part in a pancake race on Shrove Tuesday. 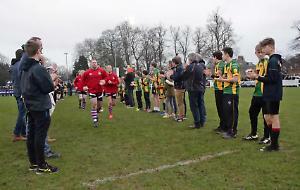 Residents from the home off Wargrave Road watched as they raced around the lawn beside the River Thames under the eye of a referee who ensured they tossed their pancakes as well as running. The winner was Karina Skidmore, the home’s clinical lead, who received a bottle of sparkling wine. Valerie Johnson, the home’s well-being co-ordinator, who organised the event, said: “There were lots of screams from the staff as they ran along the course and cheers from the residents who came out to watch.